Jillian Green DiGiacomo grew up in a New Jersey suburb and currently lives in a New Jersey suburb (though not the same suburb). Once upon a time, she graduated with a degree in Asian studies from Vassar College and received a master's degree in teaching from the Harvard University Graduate School of Education. Before having children, she spent most of her time either teaching English in Japan or teaching Japanese to high school students in New York. After having children, she completely forgot how to speak Japanese and has a hard time with English most days. 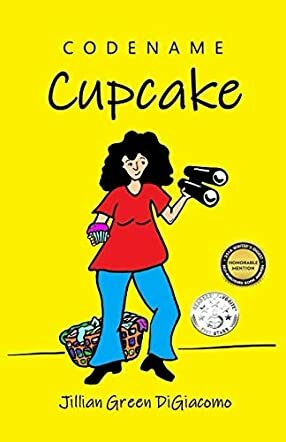 In Codename Cupcake by Jillian Green DiGiacomo, married mother of two, Molly Peterson, decides to give herself some cherished alone time after her youngest child, Olivia, finally starts school full time with her older brother, Michael. When every misadventure imaginable creeps into her mind, Molly cancels her alone time and starts heading home as fast as she can ... just in case the children need her. After ducking into Madame Tussaud’s Wax Museum for a tour before mindlessly foiling a robbery outside, Molly collects her daughter from school. On learning that both of her children had a miserable first day at school, she makes jokes which result in both of her children smiling before they get home. Little does Molly realize that her confrontation with the gun-toting would-be robber that day had actually been caught on camera. The following morning, reporters are camped out on Molly’s front lawn, with the news headlines labelling her as a crazy Vigilante Mom. As a camera flashes a blue light in front of her, Molly suddenly feels strange and sleepy. On waking, she finds herself full of energy, transformed into a mother who loves to cook, clean, bake, organize and take charge. Enlisted by the SSO under the codename of Cupcake, Molly’s first assignment is to investigate a rather unusual occurrence of cold temperatures at her son’s school, requiring her to join the PTA and get involved with every aspect of school and faculty, with surprisingly shocking and hilarious results! Oh, the hilarity! I woke my sleeping shift-worker husband a few times by laughing so raucously at regular intervals while reading Codename Cupcake. Jillian Green DiGiacomo’s visual wit when creating the verbal motherly advice of Molly Peterson is unbeatable! Before becoming a mother, Molly’s idea of not being impressed involved rolling her eyes and silently muttering things under her breath, but after bringing two children into the world, she can now go nose-to-nose with the best of them without cracking a sweat. Going from a food-stained, bed-haired mother who is full of excuses to a super tough and efficient mom who never runs out of energy takes a phenomenal piece of imagination, combining comic book heroes with Stepford wives and beyond. I thoroughly enjoyed Codename Cupcake and recommend this book to all readers who enjoy action, adventure, humor, mystery and fun bundled up with their outside-the-box superhero adventures.